Be sure to check out defending champion Chris Walker, Guinness World Record Holder Christopher Smith, Olympic medalists Bernard Lagat and Nick Willis, Swing Man Golf’s Jaacob Bowden, and many others at the 2013 Speedgolf World Championships at Bandon Dunes this weekend on October 25th and 26th from 8:00-12:00 PST. If you liked this article about the webcast of the 2013 Speed Golf World Championships and you think it would help another golfer, please like it. The Speedgolf World Championships have wrapped up…and what a fantastic event! Congratulations to Ireland’s Rob Hogan on putting together two stellar rounds to become World Champion! Hogan beat a stellar field that included two Olympic medalists, the world’s winningest 100-mile ultra marathoner, a Guinness World Records holder, and many more elite athletes. 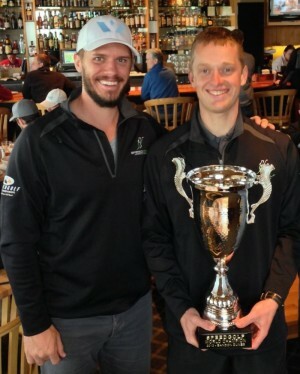 Swing Man Golf’s Jaacob Bowden got off to a tough start in the first round but rebounded in the final round by tying the championship record for golf score. He finished in 14th place. Many thanks to the sponsors for their top notch support! If you liked this article about the 2013 Speedgolf World Championships results you think it would help another golfer, please like it. The field is shaping up for next month’s Speedgolf World Championships. These guys are amazing…shooting in the 60s and 70s in under an hour! – 2012 Speedgolf World Champion. – Varsity golf at Stanford from 1994-1998 – captain of the team in 1998. -Teammates at Stanford included: Tiger Woods, Casey Martin, Notah Begay, and Joel Kribel. – Ice hockey player entire life – captain of the Stanford hockey team (club). – Winner of the 2012 Amateur World Speedgolf Championships. -Current mini-tour player in Europe & U.S.
-Played college golf in U.S.
-Recently shot 67 in 43 minutes on 6000 yard par 70 in Raleigh, N.C. If you liked this article about the Speedgolf World Championships field in 2013 and you think it would help another golfer, please like it.